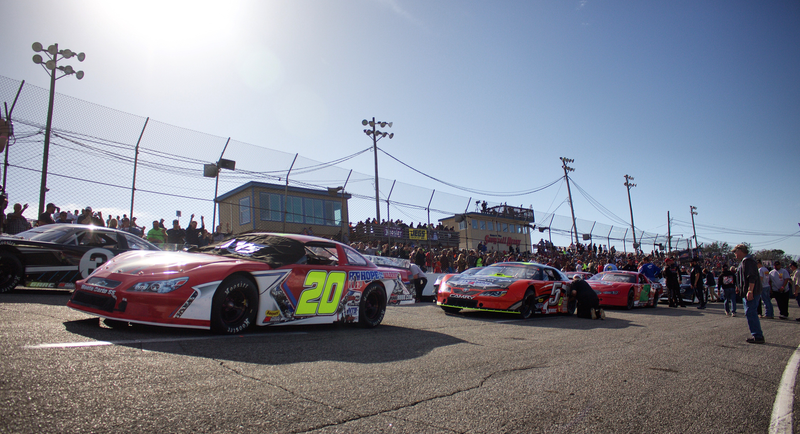 The Snowball Derby is arguably the biggest, most prestigious short-track race in America. What viewers and casual fans probably don’t know is the Derby, like many short-track races, is plagued by outdated, restrictive and unethical media policies that suffocate coverage and help keep it out of the national spotlight. This week has proven that those policies can change for the better, giving me a new hope for the industry and for this race. But while some progress is better than no progress at all, there’s still a lot of work to be done. The history of the Derby—a 300-lap Super Late Model race held every year in the first week of December—began in 1968, and each year around 70 drivers head to a tiny short track in Pensacola, Florida to fight for 37 spots in the field. It brings out everyone from Late Model standouts to NASCAR’s top competitors. If you know about it, you know that it’s a big deal. Chances are that unless you’re a big Late Model fan, you don’t know about it at all. That’s part of the problem. But what many would consider an unethical relationship between the promoters of the race and their “official news site” has slowly stifled the voice of attending media outlets, and even driven some, like Jalopnik, away. That media policy, in a quick summation, highly restricts credentialed press at the race due to that “official” site having significant control over what they can and cannot do, including when videos can run, how many tweets reporters can tweet and even what the tweets can be about. If you’re wondering whether that’s normal in racing, it’s not. Jalopnik editor-in-chief Patrick George and I debated how best to tell this story for months, and until recently, we ultimately decided against it as to not come off as entitled. Then, we learned we weren’t alone in our criticism. I have also agreed to a less strict version of the policies below in previous years, because like a lot of reporters, you have no choice if you want to bring coverage of the Derby to your audiences—and speaking up, as we’re doing now, runs the risk of being barred from covering this and other short-track races. The media agreement for the Snowball Derby at Five Flags Speedway. This is a rather long and convoluted story, so let’s go from the beginning. The photo to the left is the media agreement that I have signed in past years; it has since been amended with even stricter regulations. While I covered the race last year, Jalopnik decided in light of these older restrictions not to attend in 2016. This agreement is put forth by the race track, Five Flags Speedway, and its designated “official news site” and the broadcaster of a paid live stream from the race, Speed51.com. The website has partnerships with other short tracks and events around the U.S., and has the power over the credentialing of media members who apply to cover the Snowball Derby. As for why that causes concern, it’s as if Sports Illustrated hypothetically had control over the credentialing and governing of journalists at the Super Bowl. They could do whatever they wanted and silence whomever they wanted, especially if said people interfere with profits. FFS has an exclusive partnership with Speed51.com, the official live media coverage provider of the Snowball Derby. Speed51.com, as the official media coverage provider, has the right to any multi-media content produced during the Snowball Derby week if requested. Proper attributions will be applied during usage. News organizations that wish to provide video content (pre or post-race) must do so in a timely manner and must air within 36 hours of the completed event. Video clips/highlight packages cannot exceed five minutes in overall length. Video highlights must be produced for a credentialed and approved media outlet and cannot be used for personal use (Facebook, personal blog, etc.). Video used on a for-profit purpose without the expressed written consent of Five Flags Speedway is prohibited. All credentialed media are asked to be mindful of the business partnerships and dealings of Five Flags Speedway and the Snowball Derby when posting information regarding the Snowball Derby events. The bolded statements above present several problems. The whole “exclusive partnership” part is explained in the Sports Illustrated analogy above. As for the second bolded one, imagine that now Sports Illustrated also has the rights to any content made by, say, Deadspin at the Super Bowl. Now you can see why an outlet might give pause before agreeing to attend. And while video regulations exist at many tracks and in many race series, limiting things like length and when clips can air is incredibly unusual and unnecessary. The final bolded statement about being “mindful” of partnerships goes against what a journalist knows and practices. That’s like going to a sporting event and finding out event promoters didn’t make good on their end of a sponsorship deal, but you have to worry about your credential being pulled if you expose it—after all, you signed to be mindful of (and not risk) their business partnerships. Journalists aren’t supposed to fear that, or care. Things, somehow, got worse this year. Before we get to the new rule, let me make another comparison. Let’s say I’m at the Snowball Derby, and I want to provide coverage—whether via Twitter, live blogs or any other internet medium—like I would at any other race. People want to know what’s going on, what the broadcast may have missed, information about specific teams or competitors, or simply the unedited commentary of a person who passionately covers the sport. That’s part of the fun. But under these rules, that can’t be done. The credential form for 2016 added a new segment to the rules, as tweeted by a photographer who’s attended the event along with myself in recent years. No media member is allowed to post any lap-by-lap descriptions during the entirety of Snowball Derby week on any account and/or credentialed media outlet. The credentialed media person agrees not to Tweet, Facebook or perform any other form of social media or website update any less than 15 minutes apart. The 15-minute regulation applies to the person and not the form by which the entry is made (i.e. - credentialed media member cannot post to Twitter at 12:00pm and Facebook at 12:10). 15 minutes must transpire before an entry of any kind is made by the media member, whether credentialed or not. If you’ve ever seen the Twitter account of a person covering a race, you know that the updates come far sooner than 15 minutes apart. Jalopnik’s website is even updated mere minutes apart with blog posts from some races. That’s just the modern state of sports coverage, which most short tracks don’t seem able to catch onto. Speed51.com is honored to have a great partnership with Five Flags Speedway and the Snowball Derby. We have worked hard since 2001 with officials from the speedway to help build this event. Our staff of dedicated, hard-working journalists will continue to provide unbiased news stories without personal opinions as well as offer free coverage through our Trackside Now coverage and reports on Twitter and Facebook. We have acquired the live coverage rights to this event, but will continue to examine any policies we are part of. We invite all media to come cover this event with pre and post race stories throughout the Snowball Derby week for the media outlet they represent. The emphasis on pre- and post-race stories is important. It likely serves as to not distract from Speed51’s paid live stream. But it should be mentioned that reporters like myself and the others who attend point Twitter followers back to Speed51’s live stream multiple times throughout the race day and weekend. The rule gained momentum online, with reporters like myself, NBC Sports’ Kelly Crandall and SPEED SPORT’s Adam Fenwick tweeting that we wouldn’t be there because of these and other rules. The redefined policy will be in effect during green flag to checkered flag racing action only. The amendment to that rule was a move in the right direction, and I commend them for swallowing their pride and doing it. But it can also open the rules up to further interpretation, potentially giving the parties in control even more power over credentialed journalists. While it is only somewhat of an improvement—Speed51 can still jump in and regulate as they wish, should they not approve of the posting style—it is an improvement that began because the parties in control of the race heard what people had to say. That’s how change begins. But that’s only one of the many rules that need attention, and it highlights a larger pattern that those who have covered short-track races are familiar with: by using outdated rules, the short-track industry keeps driving itself lower and lower—away from coverage of national journalists, and out of the national eye. Keep in mind the final statement of the rule about a race post every 15 minutes from the excerpt above: “whether credentialed or not.” Fairgrounds Speedway Nashville denied credentials for short-track journalist Matt Weaver (and, full disclosure, a friend of mine) for breaking a story back in 2014. The story wasn’t negative—it simply came out sooner than this track wanted. Weaver attended the race to cover it with a purchased pit pass, and was escorted out. That’s just a small taste of how backward this industry is, as are the cases of Ransomville Speedway and Oswego Speedway in New York, and Lorain County Speedway in Ohio. The race tracks listed above made rules for participating drivers and race teams regarding what they post online, as a preliminary measure to keep media outlets from picking up anything negative being said about the tracks. Media outlets can and quite often do pick up on social media comments. Be aware that all teams depend on their sponsors to race weekly. Everyone should respect the value of our fan base and sponsors. By the time an offensive post or tweet shows up, it is too late to stop the spiraling effect for the Speedway. You may feel that you cannot control the comments made in support of your initial comments, but that is not the case. Negative social media in any form about Ransomville Speedway, Ransomville Speedway officials, or racers will not be tolerated. Depending on the severity of the incident, fines or suspensions may be assessed. Please help us by speaking with your entire team of this policy. We cannot stop you from posting negative remarks against the Speedway or Speedway Officials, but we can and will stop you from attending our events at the Speedway. Just as those speedways vowed to do with drivers, race promoters at Five Flags Speedway and Speed51 have pressured reporters during past Snowball Derby weekends by reminding the attending media outlets that a media outlet has the power to pull their credentials. That relationship makes it tough for reporters to do their jobs, and it doesn’t make tracks look good either. And again, it has the unintended side effect of keeping these events from reaching wider audiences. I love the Snowball Derby. I love short-track racing. I only hope that one day, myself and the rest of the motorsports press can be allowed to cover the industry without arbitrary restrictions. And with the actions Speed51 took in response to the stir from their social-media rule, I have hope that our voices will be heard in future instances. Without that, the industry can only rely on public relations to keep itself in the eyes of the people who wouldn’t know about it otherwise. And last time I checked, no one is rushing to add press releases to their bookmarks tab.